Return of Juries at Assizes. 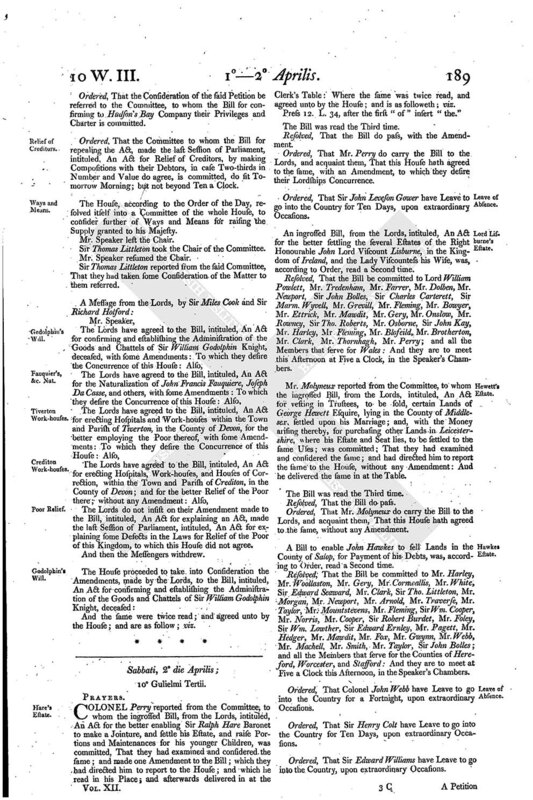 A PETITION of Matthew Bellew was presented to the House, and read; setting forth, That from the Year 1686, until after the Reduction of Ireland, the Petitioner lived with his Family in London, and was noways concerned in the late Rebellion of Ireland; yet, by some Mistake, the Petitioner happened to be indicted, and outlawed, for High Treason, in that Kingdom, on Account of the said Rebellion; but, upon Application to his Majesty, and the Truth of the said Matter appearing, the Petitioner obtained an Order for the Reversal of the said Outlawry, and was restored to his little Estate in Ireland, not 60 l . per Annum: And praying, That, in the Bill for vacating all Grants of Estates, and other Interests, forfeited in Ireland, since the 13th Day of February 1688; and for appropriating the same to the Use of the Publick; a saving Clause may be inserted for the Petitioner. Ordered, That the Consideration of the said Petition be referred to the Committee of the whole House, to whom the said Bill is committed. Ordered, That the Committee, to whom the Petition of Mr. Sevear is referred, have Leave to sit in a Morning, but not beyond Ten a Clock. 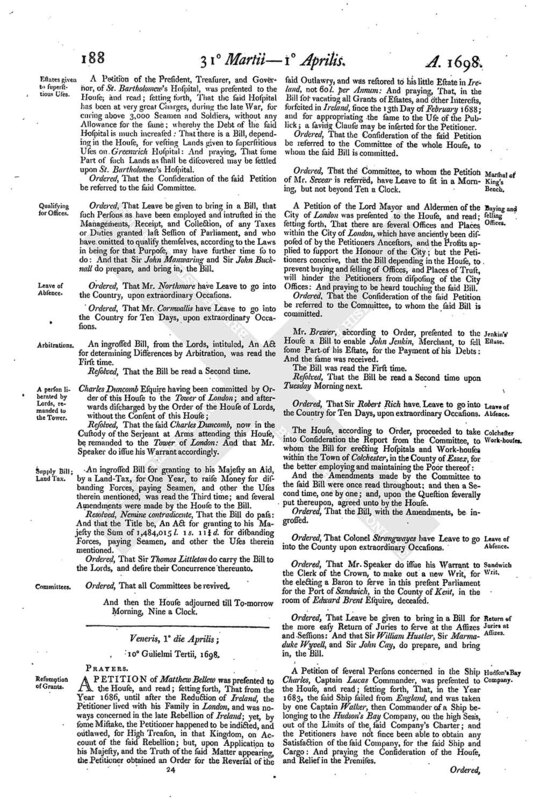 A Petition of the Lord Mayor and Aldermen of the City of London was presented to the House, and read; setting forth, That there are several Offices and Places within the City of London, which have anciently been disposed of by the Petitioners Ancestors, and the Profits applied to support the Honour of the City; but the Petitioners conceive, that the Bill depending in the House, to prevent buying and selling of Offices, and Places of Trust, will hinder the Petitioners from disposing of the City Offices: And praying to be heard touching the said Bill. Ordered, That the Consideration of the said Petition be referred to the Committee, to whom the said Bill is committed. Mr. Brewer, according to Order, presented to the House a Bill to enable John Jenkin, Merchant, to sell some Part of his Estate, for the Payment of his Debts: And the same was received. Resolved, That the Bill be read a Second time upon Tuesday Morning next. Ordered, That Sir Robert Rich have Leave to go into the Country for Ten Days, upon extraordinary Occasions. And the Amendments made by the Committee to the said Bill were once read throughout; and then a Second time, one by one; and, upon the Question severally put thereupon, agreed unto by the House. Ordered, That Colonel Strangwayes have Leave to go into the County upon extraordinary Occasions. Ordered, That Mr. Speaker do issue his Warrant to the Clerk of the Crown, to make out a new Writ, for the electing a Baron to serve in this present Parliament for the Port of Sandwich, in the County of Kent, in the room of Edward Brent Esquire, deceased. Ordered, That Leave be given to bring in a Bill for the more easy Return of Juries to serve at the Assizes and Sessions: And that Sir William Hustler, Sir Marmaduke Wyvell, and Sir John Cay, do prepare, and bring in, the Bill. A Petition of several Persons concerned in the Ship Charles, Captain Lucas Commander, was presented to the House, and read; setting forth, That, in the Year 1683, the said Ship sailed from England, and was taken by one Captain Walker, then Commander of a Ship belonging to the Hudson's Bay Company, on the high Seas, out of the Limits of the said Company's Charter; and the Petitioners have not since been able to obtain any Satisfaction of the said Company, for the said Ship and Cargo: And praying the Consideration of the House, and Relief in the Premises. Ordered, That the Consideration of the said Petition be referred to the Committee, to whom the Bill for confirming to Hudson's Bay Company their Privileges and Charter is committed. Ordered, That the Committee to whom the Bill for repealing the Act, made the last Session of Parliament, intituled, An Act for Relief of Creditors, by making Compositions with their Debtors, in case Two-thirds in Number and Value do agree, is committed, do sit Tomorrow Morning; but not beyond Ten a Clock. The House, according to the Order of the Day, resolved itself into a Committee of the whole House, to consider further of Ways and Means for raising the Supply granted to his Majesty. Sir Thomas Littleton reported from the said Committee, That they had taken some Consideration of the Matter to them referred. The Lords do not insist on their Amendment made to the Bill, intituled, An Act for explaining an Act, made the last Session of Parliament, intituled, An Act for explaining some Defects in the Laws for Relief of the Poor of this Kingdom, to which this House did not agree. And the same were twice read; and agreed unto by the House; and are as follow; viz.